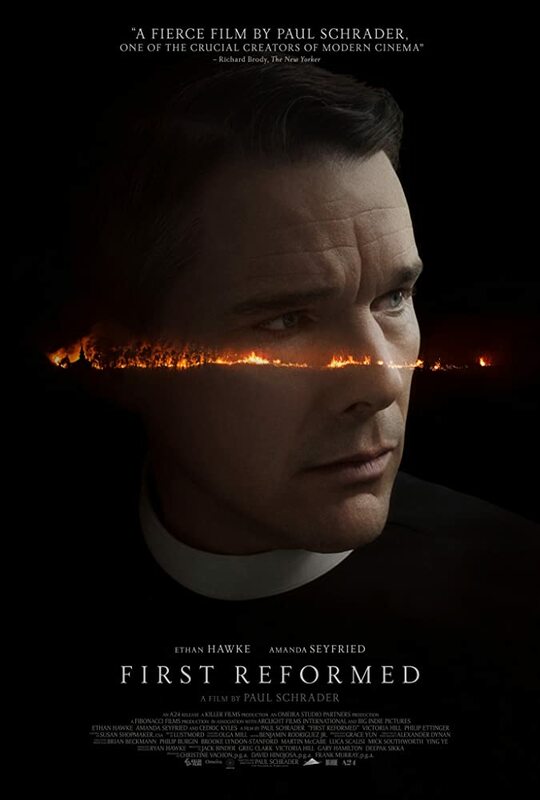 First Reformed follows Reverend Ernst Toller (Ethan Hawke), a solitary, middle-aged parish pastor at a small Dutch Reform church in upstate New York. Toller’s faith is tested when a pregnant parishioner (Amanda Seyfried) asks Reverend Toller to counsel her husband, a radical environmentalist conflicted about bringing a child into the world. The clergyman finds himself in a state of suspended identity, with everything he’s ever believed being thrown into question. Known for being the maestro that helped Martin Scorsese bring both Travis Bickle and Jake LaMotta to the big screen, Paul Schrader has celebrated an illustrious career and his newest feature is just another notch in the belt. First Reformed is a profound character piece that would make for a riveting double feature with Taxi Driver. A former military chaplain still coping with the loss of a loved one, Reverend Toller lives a routine life. His beliefs are challenged when a pregnant woman reaches out for guidance and a series of events lead him down a path of despair. Lacking fulfillment, Toller begins to see his life slip away in front of his very own eyes. The harrowing events send Toller down an existential rabbit hole where all he’s committed and believed in is brought into question. Through a series of entries in his journal that serve as narration, we see Toller digressing, asking more questions than he has answers to. It’s an effective storytelling technique that allows the viewer to get in the head of the character while not being spoon-fed all the answers. Ethan Hawke has never been better in the reserved role of the reverend. Taxi Driver and First Reformed are nice bookends to the career of Paul Schrader and the characters he’s been known to create. Both characters feel they’re destined to save young woman (Iris in Taxi Driver, Mary in First Reformed), hoping they’ll be redeemed in one way or another for their heroism. Hawke withholds any emotion, bottling it up inside as it slowly begins to anchor him down. We always think we can feel the pain of Toller though he refuses to expose any cracks in his shell, showcasing the nuanced and layered work from Hawke. Amanda Seyfried has always been a talented performer and her work as Mary shows what she’s able to achieve with a fleshed out character. Her vulnerability plays well with the stoic mannerisms of Toller. They’re able to form a bond because they both have something to offer that they’re lacking. Toller’s journey ends with him willing to sacrifice it all for the wellbeing of Mary. Cedric ‘the Entertainer’ Kyles does career best work as Pastor Jeffers, a colleague and friend of Toller’s. It’s exciting to see a comedic actor dive into a heady role and show off their range. First Reformed is a meditative study in the art of character building. Schrader doesn’t hold back as the final minutes of the film are tantalizing, leaving the viewers to digest and decide for themselves what the true meaning of the film is. The film is patient in its storytelling but never slow enough where it becomes self-indulgent.